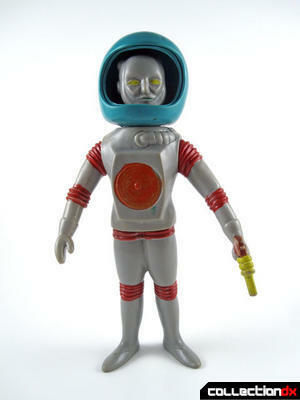 Since I don't currently have any more of the original Colorforms Outer Space Men figures, I think with this review I'll make the jump over the ones that were released in Japan by Bullmark. And since I've already reviewed the Colorforms Electron, I think that it's Japanese counterpart would make for a nice starting place. Coincidentally, this happens to be the first one from that series, called "Space King" (スペース キング) in Japan, that I acquired. So there's also a nice symmetry there. Like the soft vinyl figures Bullmark is known for, Electron, or "King Pluto"(キングプルート) is a simple figure with minimal articulation. The head can be turned, the arms rotated and the waist has just a bare amount of wiggle room where the upper and lower parts of the figure meet. This is in sharp contrast to the original figures which featured an internal wire frame that allowed the figure to be bent in many different poses. 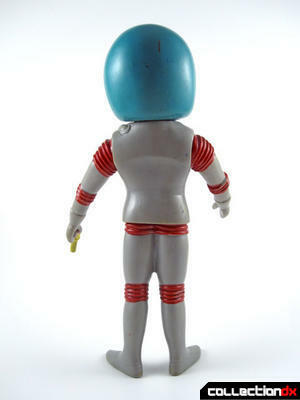 The design of the character remains basically the same, although the coloration of the suit has been altered to feature some red at the "joints". The helmet is a whole new design however. Rather than a fully clear helmet with a front and back piece instead we have a full plastic helmet with a clear front piece. Unfortunately, mine is missing the clear face plate. It seems like most loose specimens of these figures that I've seen are also missing it so at least I'm not alone. Some other subtle design changes are evident as well. The face looks less like the original source material than the Colorforms figure and the gun, here molded in place in the left hand, is a whole new design. The only marking on the toy is the word "Bullmark" on the bottom of the right foot. This figure is the typical Japanese standard size vinyl size, measuring at just slightly under 9" tall, or roughly 3" taller than the Colorforms version. Here are both versions, along with the Four Horsemen version, for comparison. Although this is still a cool figure, with the face looking less like The Man From Planet X, I find I like it less than I do the original version. 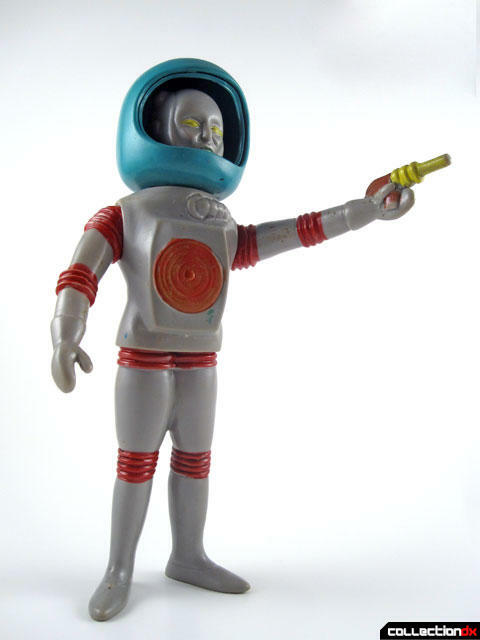 Lastly, not that it matters to me one bit, but although some might say that these figures are legit, licensed products, Outer Space Men creator Mel Birnkrant says that they are "complete knockoffs". So for that reason, even though we don't typically associate Bullmark with bootleg toys, they are categorized as such here. Unusual item, I agree the original face sculpt looks more "classic" than this version.